The Spring 2019 Citizen's Police Academy class begins Tuesday, March 19, 2019. Enrollment for this Academy is full. The Fall 2019 Citizen's Police Academy begins in August. Class meets every Tuesday and Thursday from 6 p.m. to 9 p.m. for 12 weeks. Apply online for the next Citizen's Police Academy. The Academy is designed to teach citizens about the philosophy, policies, and guiding principles of law enforcement and ethical conduct governing police services in our community. Students will receive classroom instruction by personnel from many police department divisions including presentations and demonstrations from Homicide, Crime Lab, Narcotics, K-9, and SWAT. Once training is completed, students are given the opportunity to complete an eight-hour ride-along with a police officer. This ride-along is usually an eye-opening experience for many students as they get to see the real day-to-day activities of the police. Applicants can not have any felony convictions. Applicants can not have any misdemeanor or D.W.I. arrests within the last three years prior to application date. Applicants must pass a background check conducted by the Albuquerque Police Department. Applicant must be a resident of Albuquerque Metro area. Apply online for the Citizen's Police Academy. The Fall 2019 Citizen's Police Academy class date is scheduled for August. Upon successful completion of the Citizen’s Police Academy, participants attend a graduation ceremony and are awarded a certificate bearing a replica of the Citizen Police Academy patch. 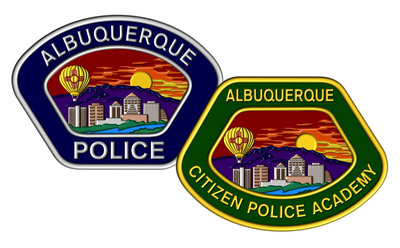 Graduates may also elect to participate in the Albuquerque Police Department’s Volunteers Services Program. The Fall 2019 session is scheduled to begin in August.